So its been almost three months and the main reason I started my blog was to make all the recipes in the book The Chocolate Bible by Le Cordon Bleu. Because obviously it is my dream to go there and study but I cant go for some reasons till then why not practice at home. So the last recipe I made was the Chocolate Pound Cake. This week was my parent’s anniversary. So I was thinking to bake a special cake for them. 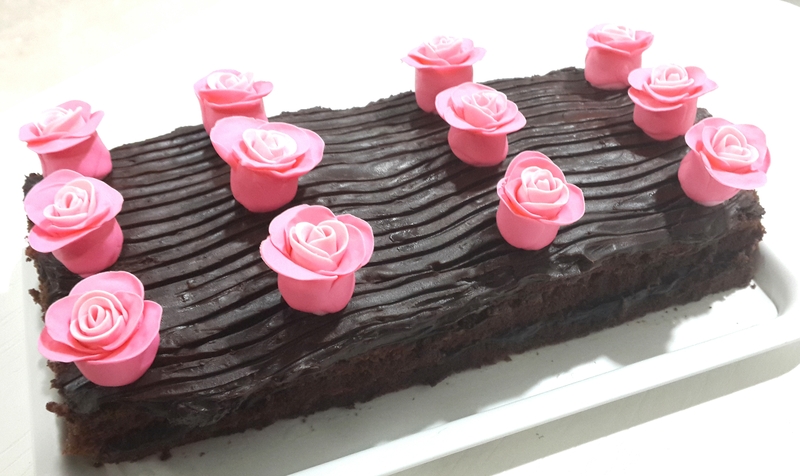 Maybe not the usual chocolate cake I make but something with a different recipe a different style. Hence I opened the Chocolate Bible and started going through it. I was torn between the King’s Cake and Sachertorte. But after counseling with everyone with what would they prefer, they somehow really liked the sound of “King’s Cake”. So the decision was made. Problem was I had chosen a different cake design for the cake. 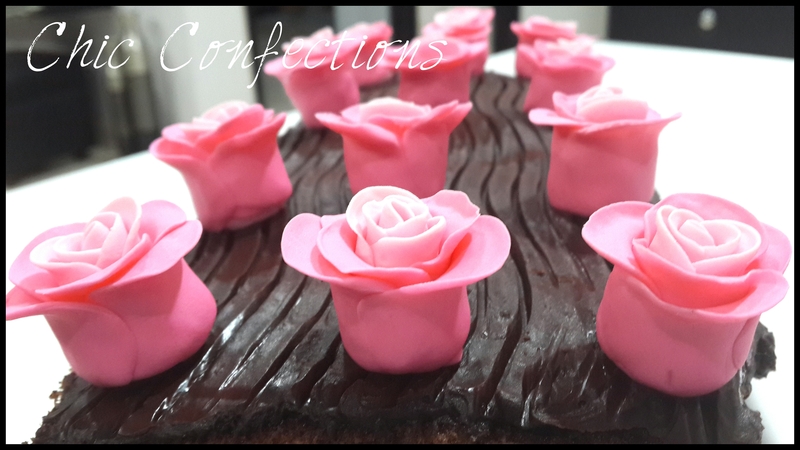 Which was round and I had already made fondant roses for the cake to make a heart on it. King’s Cake was a rectangular cake with a smaller height and larger width. Clearly heart couldn’t be made on it but still I went ahead with it. Because obviously the cake was more important than the flowers. Every time I try a new recipe, there is always a moment in it when I am like ahem ! I hope I am doing this right and I don’t mess it up. After that I think I messed it up. But I don’t give up and go through it and at the end it is always done. King’s Cake was fairly simple to make but there was still that “doubting” moment. Also the problem that occurred was I had no time on hand to repair the over cooked sugar syrup and the little extra thick ganache. But somehow after assembling the cake. I just popped the flowers on top in a row making it look like a log with roses ( I like the look okay). After that came the finale of cutting the cake and eating it. Yes you know the answer it was delicious. Though it tasted much better the next day after being refrigerated for at least 12 hours. But cakes always taste better the next day at least some do. The flavor somehow enhances overnight. Specially this one. So had super fun making it and eating it for sure !!! Thank you Le Cordon Bleu. Previous Post Cookie Week !! !